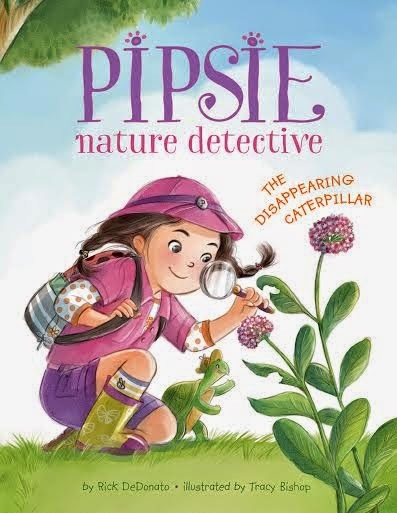 We had so much fun reading Pipsie Nature Detective: The Disappearing Caterpillar! I had my 2 year old cousin over last week so I read the book to her and my little guy. They enjoyed the story so much that they got up and ran around the room pretending to be butterflies! Made me so excited. We also ordered some caterpillars to come in a few weeks so I will revisit the book again when they come to refresh Jace on the process! In this delightful tale, Pipsie and her pet turtle Alfred, find a caterpillar. They spend time playing with 'Frannie' until one day they can't find her. They go on a mission to find their lost friend and find out she really isn't lost as much as transformed! I really loved how this book was a gentle approach to science. Perfect for my curious 4 year old. You can pick up your copy of Pipsie at your local book retailer or at online stores like Amazon! Check out PipsieNatureDetective.com for games and coloring, fun facts, more details about Pipsie and her friends, and info about the author and illustrator. There’s also a link to Alfred Z. Turtle’s blog! I would read this book to all three of our children! My boys. It looks like a cute book.